As a fair-skinned, red-headed kid growing up in Los Angeles and Baja, sunburn was a regular part of my childhood. Chemical sprays were not effective and mainstream America was ignorant of aloe's properties. Once back in L.A., after a week in San Felipe, I had bright red burning skin and a sun blister on my eye which made it hard to close. A family friend suggested I smear pickle juice on my skin and hold a pickle on the blister. Desperate, I did it. Immediately, my skin stopped stinging and the blister went down. I stank but I was no longer hurting. I later found out that vinegar is a home remedy for sunburn. People soak paper bags in vinegar and water, applying them onto burned skin to soothe it. There are many folk remedies for sunburn that work quite well. Cold yogurt is silky on tender skin and is nutritious too. Cold fizzy mineral water helps relieve the pain. The insides of cool cucumber skins rubbed on the skin feels good too. For severe burns, make a paste of slippery elm bark and water also helps. And there is also aloe vera. Slit the leaf open and use gel. Several herbs help sunburns. You can make your own aloe vera gel, to soothe irritated or burned skin (you can also use it as a hair gel!) Slit an aloe vera leaf open, and scrape the inner gel into a bowl with a sharp knife then put it in a blender or food processor and blend until smooth. Dilute it with water until it is as thick as you want. Keep the gel in the refrigerator. Calendula is a skin healing herb. Placing calendula in cool bath water, or using a tea made from calendula on your skin can help it heal. Comfrey is also good for skin. 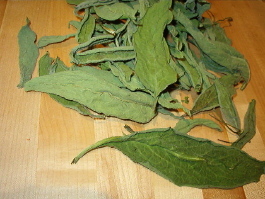 Use comfrey in bath water, in toners, etc. Comfrey will also soften the skin. 1/2 c. distilled witchhazel * 1/2 c. rose or lavendar water * 3/4 t. vegtable glycerin (these items can be found at most pharmacies and health food stores and online at places like sagewomanherbs.com). Shake your toner before each use, and spray or pat on your face/skin when it is feeling dry. Taking a cool bath with baking soda poured into the bathwater can help relieve burning and help with moisturing too. A baking soda paste made from the soda and water will also help soothe the heat and burning. To prevent peeling once sunburned, one folk remedy is to mix equal amounts of tomatoes and buttermilk. Mash and cover burn. Another peeling preventer is to mix 1/4 cup witch hazel extract, 3/4 cup rosewater, and 1 t. vegetable glycerin. Put this in a spray bottle and spray skin all over to moisturize and restore oils. This is good for dry skin whether burned or not. Just spray during the day, and dry skin goes away! Lips can get sunburned too! Protect them with lip balm with sunscreen, or zinc oxide. You can also make your own lip balms for chapped/burnt lips...here is a Chocolate Lip Balm recipe! Melt cocoa butter. Add chocolate chips and stir until melted. Add vitamin E and oil. Stir well. Pour into a nice small container...and use. I have written another article that may interest you related to heat: "Surviving Summer's Heat" ( resist.ca/~kirstena/pagesummerheat.html), which talks about heat emergencies and how to avoid and prepare to survive them.